“What has happened is absolutely not a military coup — our armed forces have responded to the desire of the people,” said Father Hani Bakhoum Kiroulos, spokesman for the Catholic Coptic Church. “Millions of people took to the streets because they were unable to live under such a regime. They expressed their views and demanded freedom, and the military took action accordingly,” he told Catholic News Service July 5. 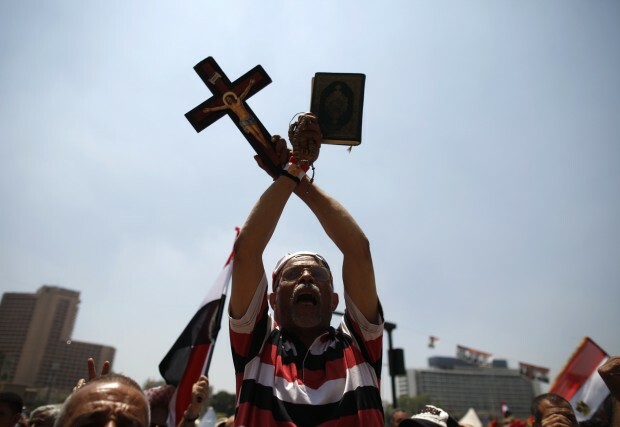 Father Kiroulos said the preceding four days of protests, in which the military deposed Egyptian President Mohammed Morsi, had united Christians and Muslims. “The church isn’t just a collection of buildings, but a mass of people — and we are part of the Egyptian people and with the majority who’ve expressed their will,” Father Kiroulos said. “If the Egyptian people suffer, we will suffer too. But we hope (they) can now all join together, Christians and Muslims, in creating a new country and a better future,” he said. The head of Egypt’s armed forces, Gen. Abdel Fattah al-Sisi, announced the takeover July 3 after giving Morsi a 48-hour ultimatum to overcome a nationwide paralysis, worsened by mass protests in Cairo, Alexandria and other towns. The move was welcomed as a “defining moment in the nation’s history” by Egypt’s Coptic Orthodox Pope Tawadros II, who appeared beside the general during his televised address, along with the country’s grand imam, Sheik Ahmed el-Tayeb. “We must convince them there is a place for them in the country and no one rejects them — but they should behave as Egyptians, as fellow citizens with other Egyptians, and not aim at establishing a religious despotism,” the patriarch said. “They should not be excluded from the political scene. But they must behave like a political party and not as a means of imposing a religious hegemony,” he added. The 200,000-member Coptic Catholic Church has 14 dioceses in Egypt. The Coptic Orthodox Church makes up at least a tenth of Egypt’s population of 81 million.